3 way fitting with inner non-return valve and pressure gauge. It has G¼" female thread where it can be mounted to a pressure switch, pressure transducer or an adapter to any other type of thread. 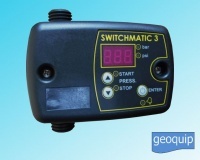 SWITCHMATIC 3 is an Electronic pressure switch with integrated digital pressure gauge. 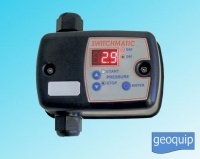 Its dry contact output is ideal for transmitting an open/close signal to an external control panel.